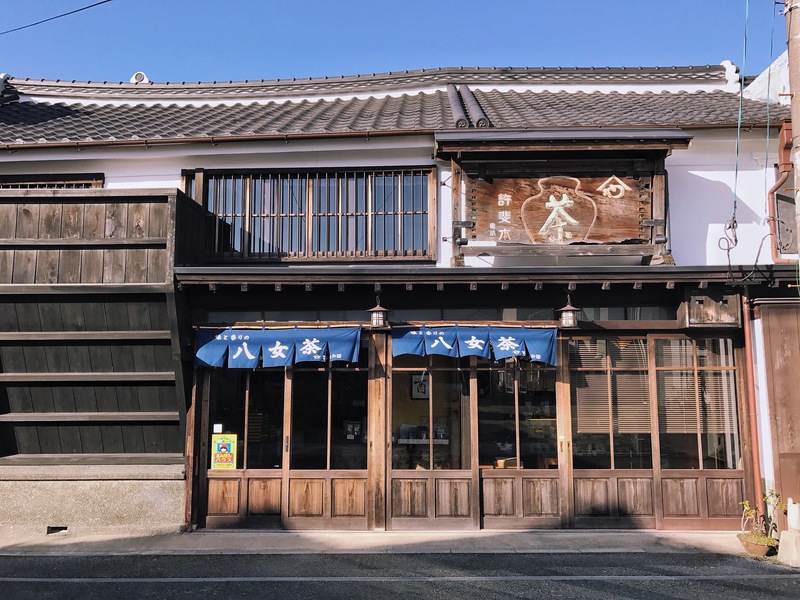 Konomien, thought it was just a shop with few drinks on the menu, turned out to be the oldest tea merchants in Kyushu! Opened the door I see an old woman wearing a traditional white apron sitting at the counter, on the right is a transparent refrigerator, to the left is the restaurant. She begins to make tea and asks me to sit down. There are crackers on a wooden plate, the hospitality surprises me. This time I remember that the phone has google translate function and I ask her to talk on the phone because I can’t understand all the sentences. She is very excited and tells her son who comes just from the office:“This is really a smartphone! ", we continue to chat slowly in this way, talking about tea industry heritage of the family, even the pattern design on a package is hundred years old. After drinking tea, she takes me for a tour from the drawer cabinet to the very steep staircase, there is a ceramic oven on the tatami, a stool pillow, and a big cabinet. I don’t know how it works. The whole space is a museum, a shrine located in the tall two floors building with a hanging chandelier. she says “lights are beautiful", she goes down the first floor and turns on the lights just to show me. We go to a storage room on the second floor, she looks at the ancient things and tells me that she really misses these memories of her life. there is a tea factory behind the house and a very formal guest house at the other side, with old window glasses, the pattern of the wood on the door engraved, the tree of central courtyard grows to the second floor. she points to one of the patterns on the window and says it is also very cute. she likes it, she is immersed in her own place with me – the only guest here, even if she did this tour several times. Back to the front desk, everything I just experienced here was even better than the tea in my cup. even if I will buy some tea back home, I can only take away my feelings of the house. I don’t like to be in a hurry but also I am losing the opportunity to take a look at the town. Finally, there is a shop open – Leap up leather studio. I walk inside and see a man in yuppie style clothing. he is kind and smiles to me. Casually we walk around, we talk few words about to leave but he stops me, “プ レ ゼ ン ト! ", Do not know why my Japanese is particularly good today, I can understand everything no matter what they say. He lets me write down my name, which gonna be engraved on a leather key chain, simply flattered. even if he wrote with ugly writing on the first piece, he changes to a new one. In addition to his own designed leather tool kits, he also a recycled Japanese primary school student school bag, made into a wallet and for other supplies. He mentions he was just interested in leather crafting, but then he became more and more professional, in about seven years later. he works full-time in his studio.“Ah, so nice, this are my goals for life!" I tell him that, I am envious. Because this are the most important things in life.